In 1890 Dutch anatomist Eugene Dubois travelled to eastern Java, Indonesia. He was on a eccentric quest to find the fossilized ancestor of the modern man. Along the Solo River near the palaeoanthropological site called Trinil, he lead an excavation team comprised of convict labourers and two army sergeants, assigned to him by the colonial government. This endeavour was crowned by the discovery of the first fossils of Homo erectus, dubbed “Java Man” – the oldest fossilized remains of hominins ever found at that time. Along with these bones, Dubois also brought back over a hundred fossilized freshwater mussel shells. Sometimes things are collected only to be packed away in some box in a dusty museum storeroom – in this case, a museum in Leiden, the Netherlands. However, such collections can yield surprises even a century later – as long as someone is willing to look. Recently biologist Josephine Joordens from Leiden University was looking into the question whether H. erectus from the Trinil area used sea animals for food and resources. As part of her project she had a look at the Dubois collection of shells, and accidentally discovered a faint zig-zag engraving pattern on one of them. You might remember the story I wrote about Gorham’s Cave. 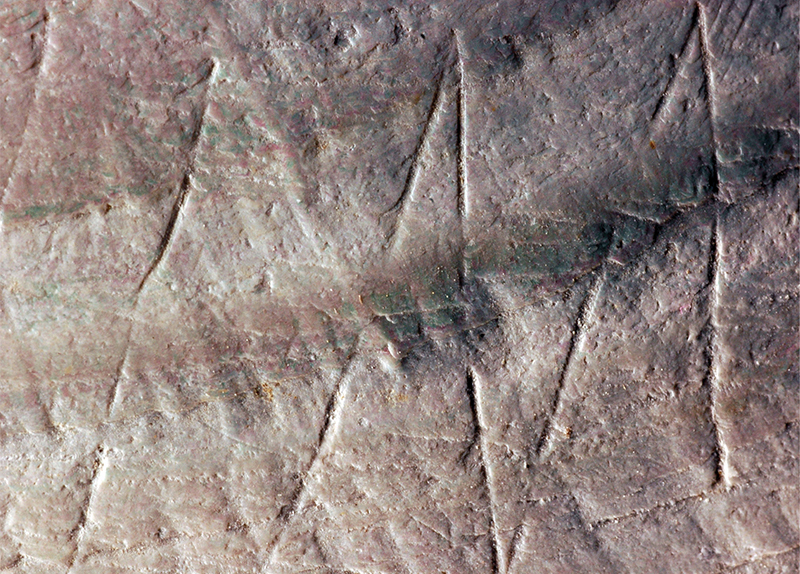 That’s the place in Gibraltar where a rock engraving, attributed to Neanderthals, was recently found, making it the first evidence of carving or ‘abstract art’ by any extinct human relative. The shell engraving is akin to this discovery, but different still. For starters, it’s much older – by dating the sediment embedded in the shells, Joordens’ team was able to determine an approximate age of 500,000 years. The engraving seems to be deliberate – judging by the carefully interconnected lines – and was done painstakingly, with a very sharp tool, as the researchers found when they tried to replicate the etching on various shells by themselves. A finding like this once again requires a re-think of what we know – and don’t know – about our ancestors and their capabilities. And it also makes me wonder what else might be hidden away in museum drawers around the world.